Epithelium: simple cuboidal. Atlas of Plant and Animal Histology. Organ: trachea, exocrine gland of the trachea, excretory duct. Technique: PAS-haematoxylin, 8 µm thick section, paraffin embedding. 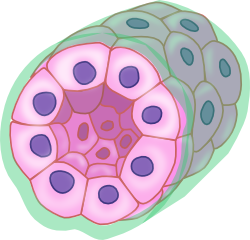 Simple cuboidal epithelium is a layer of cube-like shape cells, i.e are as wide as tall. This can be observed when they are cut perpendicularly to the epithelial surface. The nucleus is rounded and located centrally or slightly basal in the cell. 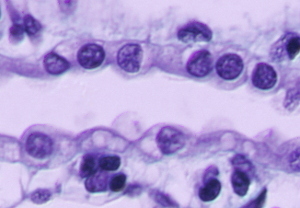 Sometimes, the apical surface of the cell shows cilia or flagella. This type of epithelium lines many ducts and tubes such as secretory ducts (thyroid gland), excretory ducts (exocrine gland ducts) and ducts for absorption/excretion (renal tubules) or respiratory ducts (lung bronchioles). 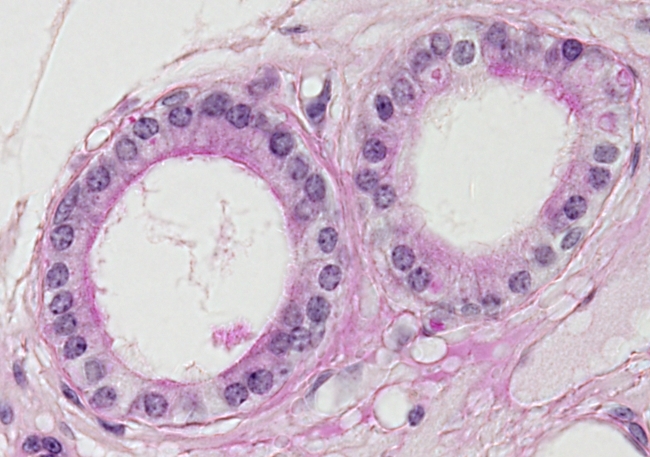 Simple cuboidal epithelium from bronchi of the lung. 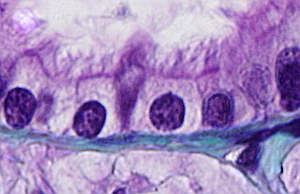 The apical surface is full of cilia. 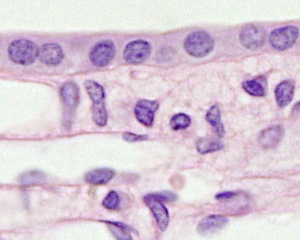 Convoluted tubules of nephrons are formed by simple cuboidal epithelium. 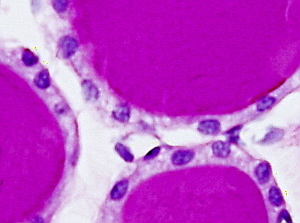 Crosses indicate proximal convoluted tubules with microvilli in the free surface (pinky colour of the inner part of the tubule), whereas asterisks indicate distal convoluted tubules. 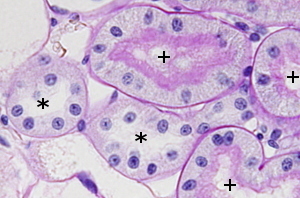 The collecting ducts of the kidney is lined by simple cuboidal epithelium. Cells are slightly rounded. The thyroid follicle is made up of simple cuboidal epithelium, which releases hormone precursors to the inner part (red color). Renal papilla is covered by simple cuboidal epithelium.